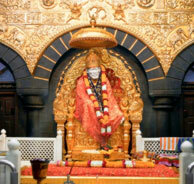 Shirdi is a best known for being the holy shrine of Sai Baba. It attracts a flock of Baba's devotees every day. If you are one of them and want to visit this holy shrine, goaroundtours.com brings this exclusive religious holiday package for you. It is a 2 nights / 3 days tour that will take you through a spiritual journey of major attractions of Shirdi. Book this tour now and embark for a divine journey. Located right opposite to Sai Baba Temple, this 2 star hotel provides excellent accommodation for devotees looking for value for money services. It is located at a distance of 3 KM from Sainagar Shirdi Railway station and just few minutes' walk away from bus depot. Its on-site restaurant serves delicious South Indian, Chinese and Punjabi dishes. Meet our representative on arrival at Mumbai International Airport who will transfer directly to Shirdi (around 7-8 hours) and assist you in hotel check-in. Relax overnight at the hotel. Wake up early in the morning to attend the morning Aarti and Sai Baba Darshan. Later, come back to the hotel and have breakfast. Proceed for a visit to Shani Shingnapur temple (approximately 1.5 hours away). Return to Shirdi for dinner (on direct payment basis) and overnight stay. Go for morning darshan at Sai Baba Temple and return to the hotel for breakfast. Check-out from the hotel and get transferred to the Mumbai International airport to catch flight to onward destination.